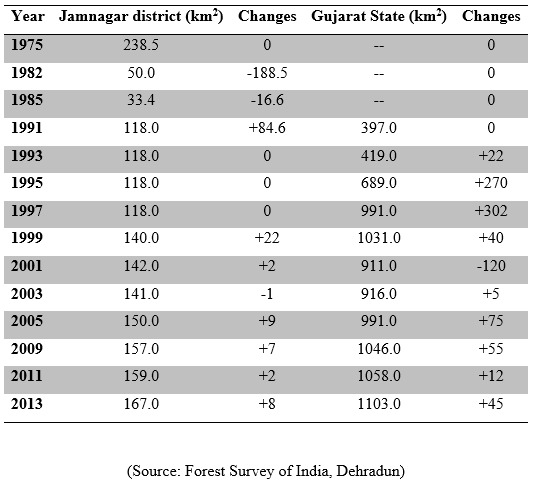 In 1985, there was a substantial reduction in mangrove diversity in the Gulf of Kachchh. The degradation of mangroves was due to frequent droughts, cutting, lopping, grazing, collection of fire wood and diversion of mangrove areas for other purposes mainly salt pans, industrial development and establishment of ship breaking yard near Sachana and Bedi Port in the past. However, after constitution of Marine Sanctuary and National Park, the area has shown gradual increase in the mangrove forest cover on account of improved protection, afforestation and subsequent natural regeneration. 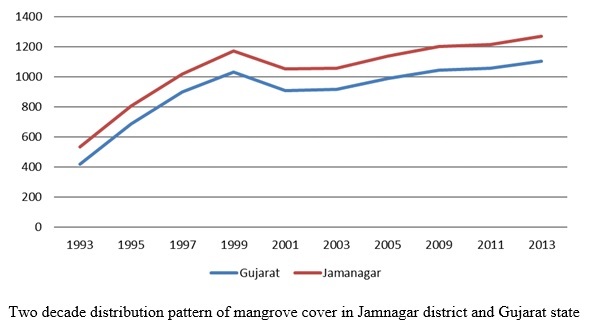 The mangrove cover in Jamnagar district has increased almost five times (167 Km2) since 1985 (33.4 Km2). Artificial regeneration of mangroves on mudflat is carried out every year as a part of regular activity. The annual plantation targets were very small up to 1990-91 starting with an area of 7 ha at Pirotan Island in 1983. However, the target of mangrove plantations has been increased subsequently in various schemes such as Centrally Sponsored Schemes, State plan, J.I.C.A., I.C.Z.M. and Natural Disaster Management. From 1983-84 to till date, 42,188 ha. area has been planted with mangroves. Mangrove plantations are raised through nursery raised seedlings by direct seed sowing and raised bed techniques as per suitability of site. There has been a gradual improvement in the techniques of raising mangrove plantations and the raised bed technique was also standardized in Marine National Park during late nineties. Coral reefs are highly productive ecosystem in the coastal zone which are highly valuable and contributing to the sustenance of the country through fisheries, tourism, pharmaceutical etc. Coral reefs with its associated organisms form a spectacular underwater view, attracts the tourist, as it considered as an underwater paradise. Coral can be divided into reef building (hermatypic corals) and non-reef building (ahermatypic corals). Hermatypic corals usually contain millions of tiny algal cells, called zooxanthellae, with their tissue and these algae are primary energy source for the reef-building activities of hermatypic corals. Gulf of Kachchh (GoK) is northern most reef region in India where the distribution of biota is determined by the factors like arid climate, large semi diurnal tidal amplitudes and negative water balance. Coral reefs, Sea grass and Mangrove are the three main ecosystems in GoK, which are considered as nature’s natural sanctuary. Marine National Park, Forest Department initiated certain conservation measures for coral reef and are as follows. National Institute of Oceanography (NIO) in association with Forest Department carried out translocation of coral colonies coming in the passage of jetty and subsea pipeline near Narara reef of MNP & S. About of 326 live corals in the intertidal pipeline corridor area, 176 live corals in the intertidal jetty corridor and 1879 live corals in the subtidal pipeline corridor were identified for translocation at three sites at Narara reef during May/December 2004. The intertidal corals mainly belonged to genera Favia, Favites, Porites, Cyphastrea, Siderastrea, Leptastrea, Turbinaria, Goniastrea and Coscinaraea whereas, the subtidal corals were represented by 23 species belonging to genera, viz., Goniastrea, Favia, Favites, Platygyra, Goniopora, Cyphastrea, Hydnophora, Siderastrea, Coscinaraea, Porites, Montipora, Leptastrea and Turbinaria. For the first time in India, Gujarat Forest Department initiated coral rescue program in collaboration with Wildlife Trust of India (WTI) and Tata Chemicals Ltd (TCL) at Mithapur reef. The team consisted volunteer from WTI, TCL and Forest Department. The main agenda of the program was to recue corals damaged due to natural and anthropogenic effects like fishing or other activities. For this purpose, during low tide, team members rescued upturned corals and placed them in right position in the suitable place. There were around 30 upturned and disturbed corals which were rescued during this exercise. Subsequently, three rescue programs between February to May 2011 and July 2012 were conducted. This program helped to create awareness among the local people about coral reef. Following the event, during April 2013, a total of 22 artificial reefs were deployed at Laku point and Mithapur reef area. The program lasted for two days with the participation and support from Gujarat Ecological Commission, Zoological Survey of India, WTI, Indian Navy, Indian Coast Guard, TCL, Eco-club volunteer and local fishermen. The participants were divided into two teams where one team involved in coral rescue operation while other involved in Artificial Reef formation. The coral rescue team collected the damaged corals which were then placed on the artificial reefs, giving them a better chance of survival and regrowth. A total of 110 cubic meter area has been restored during the event. More such activities have been planned in future. A total of 10 fragments of A. humilis were transplanted on two 1m2 platform at subtidal depths at Mithapur Reef whereas, a total of 8 fragments were transplanted at Laku Reef (Poshitra) at about 2 m depth in the sub tidal area. The transplanted corals at Laku reef survived for three months and the fragments at Mithapur survived for six months after transplantation. Continuous monitoring of water temperature revealed that the temperature increased gradually up to 31 °C between June to July 2012 and followed by gradual decrease from mid-July onwards, which resulted in bleaching of transplanted coral fragments. During March 2012, Under ICZM project, GEER Foundation has carried out transplantation of 250 fragments of four native species, namely, Favia speciosa, F. favus, Porites lutea and P. compressa. The fragments were collected from Bhaider Island (150 fragments) and Laku Reef (100 fragments) of Poshitra area of Marine National Park (MNP). These species were transplanted in seven frames in the tidal pools (intertidal area) on Narara Reef. The fragments have recorded radial growth and two fragments of Porite slutea showed astonishing growth on the substrate. In addition to that, another 125 coral fragments belonging to four species viz. Favia speciosa, Favi afavus, Porites lutea and Porites compressa were transplanted during March 2013 from donor sites of Boria reef to the recipient site at Narara reef. Gujarat Forest Department in collaboration with Zoological Survey of India has transplanted 400 sq. mts. area during March 2014 with 1569 fragments of local species namely Favia, Favites, Porites, Siderastreaand Goniopora. The 400 sq. mts. area transplantation was done in channel of Pirotan Island to develop the site a coral park to promote tourism. Indiscriminate expansions of human population, urbanization and industrialization have accelerated the rate of erosion, destruction and degradation of forest and wildlife leading to ecological imbalance. With a view to generate awareness, imparting of trainings, knowledge to arouse curiosity and inculcate love for wildlife and nature amongst public, Nature and Environment Education Camps have been started from 1982-83 and up to 2013-14, a total of 1837 camps have been organized and 10,1,427 students have been educated. These camps have been mainly organized on Narara Bet, Khijadiya Bird Sanctuary and Poshitra (Bhadu). Eco Development Committee (EDC) is one of the components of socio-economic activity. It is an autonomous body formed in each village comprising of 11 members with 50% of female members and one Member Secretary from Forest Department, may be a Forest Guard or Forester. The committee has been registered with The Charity commissioner and all the developmental activities under I.C.Z.M.P. in the village are carried out through EDC. The refineries around Marine National Park have established their Single Buoy Moorings (SBM) in deep sea for the easy transportation of crude oil. While loading and unloading of the crude oil in SBMs, there are chances of oil spilling which may cause adverse effect on the marine ecosystem of the Marine National Park. To monitor such incident, Marine National Park, Jamnagar has established Oil spill Monitoring Unit which is functionalized since 2013. The main function of this unit is to check presence/absence of the oil traces by collecting and analyzing the water samples from nearby areas of these nine SBMs. Coastal monitoring was carried out by Marine National Park, Jamnagar to assess the status of coral reef and its associated flora and fauna every year with multiple objectives. The factors such as sedimentation and algal coverage contributing to the loss of coral reef biodiversity are also assessed. The monitoring is done by laying quadrant and Line Intercept Transects in the coral reef area parallel to the sea. This exercise is taken up during minus tide when maximum coral reef area exposed.